When creating an about page for a web application, we often add the build date information. To get the build date, we can query the executing assembly file and get the last write time property. In Dynamics CRM, users can add notes to make comments about certain changes that were made to a record. In some instances, there may be a requirement to automate the creation of notes based on certain field information changes. The challenge with notes is that it is not a field on the entity. It is actually a 1:N association which is displayed on the form with an embedded IFRAME. This means that we can’t just populate a field, but instead, we need to call the REST web services on dynamics to request the creation of the note. The Dynamic CRM web services are RESTFul. For the creation of a new note, we to set the verb to POST. This method resolves the server URL and current organization name. This is the object associated to the notes. I.E. A note can be associated to an account or other custom entity that support notes. These values can be fetched by using the Xrm client object model. It uses the current context to retrieve the entity information. After creating the JSON references, the script uses the NoteManager method to post the request to the web services. The callback handlers are called after the web service call has completed. When testing this web service, you can call this method to verify what current version is deployed. With HTML, we often implement the editable contents with a TextArea, Text and RichText editor controls. With HTML5, we can use the ContentEditable attribute on any content element to allow users to edit and change the content. We should note that the main purpose of this attribute is to allow users to update the content, but it does not allow the user to format the contents with text effects. For that type of functionality we would need to add a plugin that can support rich text capabilities. Enter the number of days next to the Days before password expire text box. This is an image of how this should look on the new Office 365 with SharePoint 2013. We can also note that the notification settings can be updated from this view. By default, it is set to 14 days. 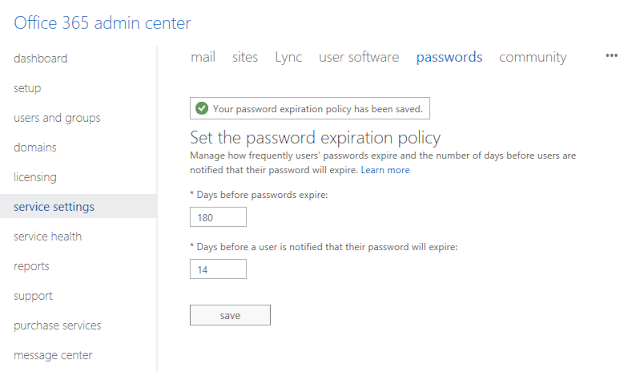 This means that 14 days prior to a password expiring, the user gets a notification indicating that the password is about to expire. Note: Controls on the web form are set with lowercase letters. I hope you enjoy this quick reference.